⋅ In 2018-19, students came from 38 states across the U.S. and 19 foreign countries. ⋅ Fall 2018 academic scholarship guarantee for incoming freshmen who complete the admission application file by April 15, 2019. ⋅ In-state scholarships $1,000-$3,500; out-of-state scholarships $15,000-$17,500. New College’s unique academic program allows students the flexibility to pursue their own special areas of academic interest. In addition to classroom courses and seminars, students meet individually with faculty mentors to develop tutorials, independent research and creative projects, and off-campus study experiences to further each student’s academic goals. The college’s beautiful 110-acre bayfront campus lies along Sarasota Bay, adjacent to the Gulf of Mexico, on the former estate of circus magnate Charles Ringling. New College is located just a few minutes by bus or bicycle from downtown Sarasota, which Money magazine named one of the country’s “best places to live.” Cultural and recreational resources abound, including the Ringling Museum of Art; the Van Wezel Performing Arts Hall; ballet, orchestra and opera companies; and the white sand beaches of Siesta Key, named by the Travel Channel as one of the world’s premier beach destinations. For a small school, New College students consistently garner a large number of top prizes and awards. As of 2018, the College had 86 Fulbright scholars — reinforcing its status as one of the nation’s leading undergraduate institutions in terms of per-capita Fulbright winners. New College students have received many other prestigious awards, including Critical Language and Benjamin A. Gilman scholarships from the U.S. Department of State; the Barry M. Goldwater Scholarship in mathematics and science; the Truman Scholarship for public service; the Udall Scholarship for commitment to the environment; French, Spanish and Japanese governments Teaching Assistantships; a Kremlin Fellowship; and numerous National Science Foundation “Research Experiences for Undergraduates” for funded summer research in labs across the country. New College is a member of the Cross-College Alliance, which is comprised of five higher education institutions in the Sarasota-Bradenton area. Students may cross-register for courses at any of the member institutions: Ringling College of Art + Design, State College of Florida, Ringling Museum (Florida State University), and University of South Florida Sarasota-Manatee. 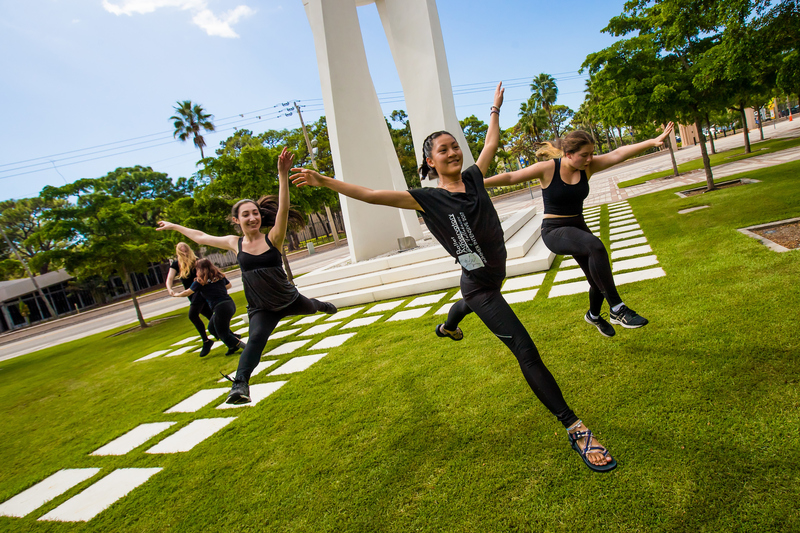 The Andrew W. Mellon Foundation recently awarded a five-year $750,000 grant to New College: Connecting the Arts + Humanities on Florida’s Creative Coast to foster deeper understanding of the arts and humanities through new programs at New College and with local arts organizations and the Cross-College Alliance. During 2018, two biology professors received a $294,000 grant from the EPA for mangrove restoration research; a mathematics professor was awarded a $125,000 grant from the National Science Foundation for his work on moduli spaces; and an anthropology professor received the American Anthropological Association’s Anthropology in Media Award. The Princeton Review, Kiplinger’s Personal Finance, and Fiske Guide to Colleges consistently rate New College among the nation’s best academic values. Princeton Review listed New College as one of the nation’s Top 50 “Colleges That Create Futures” in its 2017 guidebook. Washington Monthly named New College the No. 2 Public Liberal Arts College in the nation in 2018. 97% of full-time, tenure-track faculty hold a Ph.D. or highest degree in field. New College emphasizes collaborative learning and student research. January is designated as the Independent Study Period, a time to complete a faculty-sponsored project that pursues a particular interest in depth. Students may take on an internship, work on a play or other creative project, and/or do intensive field, lab, or library research. Because New College believes that learning should be a highly personalized and individual experience, students receive detailed narrative evaluations rather than grades from their professors at the end of every course. Students also work one-on-one with faculty to research and write a senior thesis, the culmination of their academic program. The campus includes a mixture of historic buildings — many still in use for classrooms — and state-of-the-art science and research facilities, including the Pritzker Marine Biology Research Center and R.V. Heiser Natural Sciences Complex. In 2017, a new wing of the Heiser Complex opened, increasing laboratory and classroom space by 50 percent. A new 33,000-square-foot center for academic life at New College opened in fall 2011. The LEED-certified building is home to 10 classrooms, a computer lab, 45 faculty offices and a lushly landscaped central plaza connecting to the adjacent library. Students can join 50 ever-changing and evolving organizations on campus, with interests ranging from politics and religion to languages, sports, academics, hobbies, social activism, and food. New College’s Sailing Team launches from the campus bayfront and competes in regattas across the southeast. Students can borrow and take lessons on sailboats, kayaks and canoes. Long-running music groups for students include the New Cats Jazz Band, the New College Chorus and Acapellago, an a capella group. Students run an award-winning weekly newspaper, The Catalyst, and work at a college-affiliated community radio station (WSLR-FM). Diverse guest lectures, theater and dance performances, art exhibitions, and musical events are regularly held on campus, including a cutting-edge contemporary music series, New Music New College, in which students collaborate each year, as well as [performance @ new college], a college theatrical production company under the artistic direction of faculty in theatre and performance studies. The Four Winds Café and student “walls” (parties) offer informal opportunities for students to get together, dance, talk and play music. The New College Student Alliance, based on a “town meeting” model, is the student governing body and represents an active form of direct democracy. About 78% of students live on campus. Five new state-of-the art “green dorms” feature apartment-style living, high-ceilinged common spaces and fully equipped community kitchens. Community service is a vital piece of the New College experience. Each year our campus performs over 2,000 hours of service with local organizations through academic courses, service days, and through our ‘Common Challenge’ program. By graduation, most students complete at least 20 hours of community service through academic courses, service days, and through our ‘Common Challenge’ program. More than 80% of students perform community service before they graduate. Students can choose to live in dorms designated as a themed “living-learning community,” including the International Village, Sustainable Living Learning Community, and Writing Living Learning Community. New College is one of the few campuses nationwide with a VISTA (Volunteers in Service to America) program. In 2012 New College’s beautiful outdoor spaces were enhanced by restoration of 1,000 feet of Sarasota Bay shoreline, including a historically accurate balustrade, lighted paved esplanade and seating, and an inter-tidal lagoon, returning the shoreline to a more natural condition and serving as a laboratory for student research. In 2013 New College dedicated a modernist bell tower in the plaza outside the school’s library, with carillon bells, made in a famous French foundry, which can be programmed by the college’s music students. Within six years of graduation, 80% of New College graduates continue their education and 44% earn at least one additional degree. Even more remarkably, New College is the nation’s top public college for producing the highest percentage of undergraduates who go on to earn PhDs. The most common fields of work for New College alumni are: education, business development, media and communication, research, and community and social services, according to LinkedIn. The top graduate or professional schools attended by recent New College graduates include the University of Michigan, the University of Oregon, the University of California-Davis, Bentley University, and Stetson University College of Law. New College has produced 86 Fulbright Scholars (including 50 in the last 10 years), 24 National Science Foundation Graduate Research Fellows, 19 Benjamin A. Gilman International Scholarship winners, six Goldwater Scholars, two Truman Scholars, two Frost Scholars, one Jack Kent Cooke Graduate Scholar, one Rhodes Scholar, one Marshall Scholar, one Gates Cambridge Scholar and several Critical Language Scholars. To read more about New College graduates, please visit this page. 60% of those with class rank placed in top 20%. 33% are students from under-represented populations.